A native of Argentina but reared in Alabama, author Lila Quintero Weaver explores the connections between immigration and race in her book, Darkroom: A Memoir in Black and White. 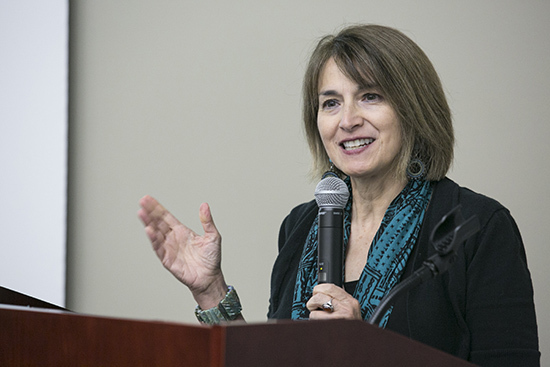 She shared her perspective in a Samford lecture entitled “My Latino American Life” as part of Hispanic Heritage Month sponsored by the university’s Office of Diversity and Intercultural Initiatives. The book, a graphic novel, is the story of her family’s immigration to the American South from Argentina in 1961. Their arrival coincided with significant developments in the Civil Rights Movement, including the dismantling of Jim Crow laws, a night of racial violence only one block from their home, and a tense and protracted period of public school desegregation. Her book was assigned reading by assistant professor of history Carlos E. Aleman in the course Cultural Perspectives 103 last semester. Her father, Jose Nestor Quintero, immigrated first via a passenger freighter in 1948 to attend New Orleans Seminary and Howard College (now Samford University), Later, he taught at Judson College in Marion as well as Marion Military Institute. He went back to Buenos Aires, Argentina, in 1961 and brought his family to America, where they settled in Marion. At the time, according to Weaver, she knew no English but after a few years, Argentina as a place and its Spanish language, disappeared. Her mother attempted to keep the culture alive via her cooking. Spanish ingredients were not readily available at the stores so she made the ingredients. Weaver said she tried to “hide who she was,” but it was difficult with a name like Lila. Weaver acknowledged that she did not realize that the murder of Jimmy Jackson in Marion led to civil rights marches that ultimately were a factor in passage of the Civil Rights Act. It was later that she became aware that she had lived in the midst of the upheaval, and her photographer-father had captured many of the events on film. In fact, the title of the book, Dark Room, came from watching her father convert the family’s bathroom into a dark room to develop the film. That, coupled with drawings, which Weaver considers a form of communication, led to the 500-images in the book. With the use of documents, such as passports, photographs, sketches and all forms of media, Weaver has compiled her family’s immigration to the United States and the racial landscape that they encountered in Alabama. The book is being used in high school and college classrooms, to teach the Civil Rights Movement, as a text in women’s studies, in Spanish classes, in the study of the memoir and in courses devoted to the graphic novel. Weaver holds the bachelor’s degree from The University of Alabama. In addition to writing and making art, her passions are social justice and hunger alleviation.